Is this FAQ officially endorsed by Sony or Philips? Why is the acronym often written with a dash in it? What is the Scarlet Book? What is a hybrid SA-CD? Can I see the difference? What is the difference between a hybrid SA-CD and a Dual Layer SA-CD? Is the stereo signal derived from the multichannel signal? Do all SA-CDs contain a stereo mix? Is the content of the 'Red Book' CD and the SA-CD layer the same, apart from sound quality? What is the difference between PCM and DSD? Wasn't CD supposed to deliver perfect sound? What does it mean when an SA-CD is recorded in PCM? What is the difference between SA-CD and HDCD? What is the difference between SA-CD and DVD-Audio? Can I hear the difference? How does multi-channel sound on SA-CD (and DVD-Audio) differ from surround sound on DVD-Video? What is Direct SBM and what has it got to do with SA-CD? Will SA-CD and/or DVD-Audio be superseded by Blu-ray Disc or HD-DVD? What is a Super Jewel Box? Are all SA-CDs packaged in Super Jewel Boxes? Do Super Jewel Boxes always contain SA-CDs? Can I play SA-CDs on my CD player? Can I play SA-CDs in my car? Can I play SA-CDs on my DVD player? Can I play SA-CDs on my HD-DVD or Blu-ray Disc player? Can I play SA-CDs on my games console? Can I play SA-CDs on my PC? Can I copy an SA-CD? Can I record my own SA-CDs? Can I output SA-CD audio via digital output? Are there any amplifiers or AV receivers that accept DSD input? How many SA-CDs are available? How do I find out if album X has been released on SA-CD? How many labels support SA-CD i.e. publish music on the format? How many brands support SA-CD i.e. make SA-CD players? How many models of SA-CD players are currently on the market? Should I buy a CD/SA-CD player, a CD/SA-CD/DVD-Video player or a 'universal' CD/SA-CD/DVD-Audio/DVD-Video player? Do I need a special receiver/amplifier for connecting an SA-CD player? Do I need identical speakers? Do I need to configure the speakers in a precise layout? Do I need special ears to enjoy the sound quality difference between CD and SA-CD? Do I need additional ears to enjoy multi-channel sound? SA-CD is short for Super Audio CD or, if you prefer, Super Audio Compact Disc - an optical music carrier that may or may not be intended to succeed the regular audio Compact Disc format introduced in 1983. In short it is designed to provide better sound quality, both in the form of higher fidelity and, optionally, in the form of multi-channel (surround) sound, while maintaining backward compatibility with CD. For more details, read on. SA-CD was developed by Sony and Philips. Who invented what exactly remains a secret shared between the two companies but is quite irrelevant. The trademarks are owned by Sony. Philips is the licensor of the disc format and the trademark. No, but we have run this FAQ against some experts in these companies to weed out any factual errors and get permission for using their illustrations. The logo simply shows SA CD - the S and A in the upper half, the C and D in the lower half. Presumably the logo is meant to convey a sense of fluid, organic, natural curves as opposed to the straight, angular shapes of the Compact Disc Digital Audio logo, representing natural, analogue sound in contrast to the imperfect digital sound reproduced with the technology of 20 years earlier. This is however mere speculation. That's to distinguish SA-CD from SACD, la Société des Auteurs et Compositeurs Dramatiques - a French copyrights body. Scarlet Book is the name of the official specification of the SA-CD format. Traditionally the books containing the format specifications of optical discs are named after a colour. A lot of names had already been used: Red Book (Audio CD), Yellow Book (CD-ROM), Orange Book (Recordable CD), Green Book (CD-interactive), White Book (Video-CD), Blue Book (Enhanced CD), even Rainbow Book (MiniDisc). But there's more. Scarlet is not just red - it's a certain shade of red. Sony and Philips might also have called it the Crimson Book or Burgundy Book for all we know but it should be seen as a refinement of the Red Book that defined the original audio CD, often referred to as RBCD (for Red Book CD) or CD-DA for the official name 'Compact Disc Digital Audio'. A hybrid SA-CD is an SA-CD disc that can be played on regular CD players. The sound quality in that case will, in principle, not be better than that of a regular CD (though the CD-compatible layer is usually derived from the high resolution signal with SBM for better sound ... or similar words). The obvious benefit of a hybrid disc is that you don't need to replace all your CD players by SA-CD players at once. In fact you could even start collecting SA-CDs before you own an SA-CD player. Hybrid SA-CD works in a different way. Both the CD layer and the high-density layer are 'read' from the same side. The other side has a printed label, so it is easy to recognize the disc and place it correctly in the tray of the CD player. How it works? The high-density layer is partly reflective, partly transparent. At the wavelength used by regular CD layers (780 nm) the SA-CD layer is invisible so a CD player will just 'see' the CD layer. At the wavelength used for DVD and SA-CD (650 nm), the SA-CD layer is reflective. In the early days of SA-CD,most titles were released as 'single layer' i.e. SA-CD-only but nowadays virtually all SA-CD releases are hybrid discs. Currently, more than 90% of the SA-CD catalogue consists of hybrid discs and this rate continues to rise. Yes. Single-layer SA-CDs look 'plain silver' while hybrid ones have a goldish shine to them. 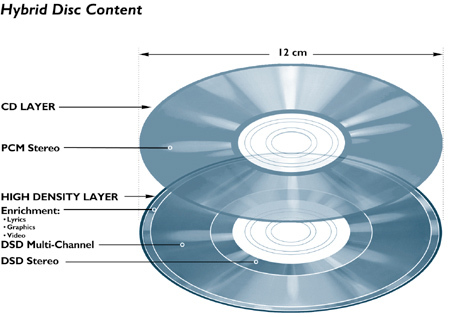 A hybrid SA-CD consists of a CD and high-density layer while a Dual Layer SA-CD disc contains two high-density layers, making it incompatible with CD players. The option of a Dual Layer SA-CD, specified in the SA-CD standard, is intended to provide more music capacity. Dual Layer SA-CDs are sometimes used for special surround demo discs or for long classical works.. They are relatively rare. No, especially in the beginning many SA-CDs released were stereo only. Nowadays most SA-CDs released are stereo plus multichannel. Two thirds of all SA-CD titles are multichannel and the general trend is up. No. Unlike DVD-Audio, the SA-CD format does not support 'down-mixing'. When an SA-CD contains stereo and multichannel sound, these are stored separately on the disc. Nearly all of them do. There are a few examples of hybrid SA-CDs that contain a multichannel mix but no stereo mix in the SA-CD layer, even though the CD layer does contain a stereo mix. Examples are the budget SA-CD series by Universal's Eloquence label. Not necessarily but in practice it generally is. In some cases you may notice slight variations in playing time. PSP is short for Pit Signal Processing - the most prominent copy protection measure of the SA-CD format. PSP is a physical watermarking feature that contains a digital watermark modulated in the width of pits on the disc (whereas data is stored in the length of the pits). The optical pickup must contain special circuitry to read the PSP watermark, which is then compared to information on the disc to make sure it's legitimate. Because DVD-ROM drives use an optical pickup that lacks this specialized watermark detection circuitry they cannot read the data on the high-density layer of a protected SA-CD disc. Pit Signal Processing has nothing to do with PlayStation Portable, another PSP name coined by Sony. DSD is short for Direct Stream Digital, the way in which the analog sound signal is described in the digital domain. It was originally invented by Sony for archiving studios' master tapes with the idea that they shouldn't be left wondering ten years later why they hadn't used a better encoding scheme before transferring and discarding these masters. Technical experts will tell you DSD is basically a 1-bit Delta/Sigma conversion scheme. We'll try explaining it in somewhat more understandable terms but cannot avoid using some technical terms too. Basically it works as follows: DSD being a 1-bit signal means that every bit represents a sample - a measurement of the amplitude of the sound wave at a certain time. Since a bit can only have two values, every bit in a DSD stream only tells weather the amplitude of the sound signal was higher or lower than the previous sample. Because it doesn't tell how much higher or lower the amplitude is, you can imagine you need a lot of samples to accurately describe the signal. Well, DSD uses 64 times the sampling frequency of CD: 2.822 MHz vs 44.1 kHz. The factor 64 is not randomly chosen. It's a power of two, meaning that it's relatively straightforward to upsample from typical PCM frequencies including 44.1 kHz and multiples like 88.2 kHz. PCM (Pulse Code Modulation) is a very abstract way to describe an analog signal in a digital way but it's the best way that existed at the beginning of the eighties when CD was developed and introduced. In PCM, every sample consists of a combination of bits (typically between 14 and 24, depending on the carrier) describing the amplitude of the signal. The number of bits determines the resolution of how finely the signal can be described, where every added bit doubles the number of levels that can be distinguished. Converting from analog sound to PCM and back to analog sound involves a fair number of processing steps, such as quantization. Every step can cause further distortions such as quantization noise, which has to be filtered out, in turn again deteriorating the sound quality. DSD on the other hand is an extremely simple way of converting from analog to digital and back. The entire process is extremely transparent. In fact, the DSD bit stream is so closely related - perhaps analogous would be a proper term here - to the analog signal that if you were to feed it to a speaker (as a series of +1 and -1 values) you'd get back audible music. Yes, it was and it did represent the state of the art in 1982 - what could be put into a CD player but also what could be put on a practical, 12-cm optical disc - but technology has progressed and so has insight into human perception of sound. For instance, it only became apparent later that although the human ear cannot directly pick up frequencies above 20 kHz they are actually of importance for the way we hear sounds. SA-CD with DSD extends the frequency range towards 100 kHz. A possibly more important difference between CD's 44.1 kHz 16-bit PCM sound quality and SA-CD's 2.8 MHz 1-bit DSD sound quality is the accuracy in the time domain. As it turns out, the human ear is extremely sensitive to minute timing differences. In fact, of the various cues our brain uses to determine the direction of sound sources, probably the most important cue is the difference in time it takes for a sound to reach our left ear versus the right ear. With a sampling frequency of CD, 44,100 times per second it's very difficult to reproduce a good 'sound stage' which is why you may find that the sound of a CD often 'sticks to the speakers': you'll hear it coming from the left speaker and from the right speaker but there's nothing in between - the proverbial 'hole in the middle'. This is an area in which DSD excels. Furthermore, at 120 dB the dynamic range of SA-CD is much improved over CD. Above all, SA-CD provides the option of multichannel sound where Audio CD only offers stereo. More about that later. Although the audio on the high-density layer of an SA-CD is always DSD or DST, the original recording may have been made using (high-resolution) PCM technology, which is then converted to DSD for the SA-CD master. Hence the confusing terms like "24-bit 96 kHz SA-CD". The DSD sample rate was specifically chosen to allow integer/fractional conversion from all PCM sample rates. HDCD (officially an acronym for High-Density Compatible Digital because the company that conceived this standard could not use a name that included 'Compact Disc') is a variant of the audio CD format that uses some otherwise unused 'subcode' bits to enhance the resolution slightly. It's an elegant approach in the sense that it provides the sort of two-way compatibility with CD like described for hybrid SA-CDs above: HDCDs can be played on regular CD players as if they were normal CDs: the player will simply ignore the extra bits. While it provides an improvement over 'Red Book' CD it doesn't approach the fidelity of SA-CD, or of DVD-Audio, for that matter. HDCD was developed by a company called Pacific Microsonics, later acquired by Microsoft. Although both aim or aimed to succeed the audio CD as preferred carrier for music by providing higher fidelity sound and multichannel sound, there are a number of important differences between the two formats. Compatibility - SA-CD provides the option of compatibility with CD players by means of the hybrid disc (see What is a hybrid SA-CD? above). While this is an option, in practice all discs released nowadays are actually hybrid. Hybrid SA-CDs can also be played on plain vanilla DVD-Video players but only in 'Red Book' CD quality. DVD-Audio discs (other than Dual Discs) on the other hand are not compatible with CD players. The format does however mandate added tracks for compatibility with DVD-Video players. This can be in the form of Dolby Digital, DTS or high-resolution stereo PCM. On SA-CD, the multichannel and stereo DSD mixes are stored separately on the disc. The DVD-Audio standard allows the player to generate a stereo downmix from the multichannel mix. SA-CD supports up to six channels at full bandwidth. Rather surprisingly, in its current form the SA-CD standard does not specify how the channels shall be used precisely. Multichannel discs use 3 to 6 channels. The SA-CD format permits additional data including text, graphics and video. In practice however, only the text option is used. It works similar to CD-Text in the Red Book CD format. While DVD-Audio is also purely an audio format, the DVD format allows combination of DVD-Audio and DVD-Video content on the same disc, even on the same side. The catalogue of SA-CD spans over 4,500 titles with, on average, 70 new releases added per month. While the difference between regular audio CD and the high-density layer of SA-CD can be quite easily perceived, even to untrained ears, the sound difference between SA-CD/DSD on the one hand and DVD-Audio/hi-res PCM on the other hand will be more subtle. A few dozen titles have been issued on both formats so if you have a player that's compatible with both SA-CD and DVD-Audio you can try for yourself. Dolby Digital and DTS were developed for movie sound effects and are perfectly tailored for that but less suited for high-fidelity music reproduction. Both apply lossy compression (much like MP3 does), whereas the DSD signal used on SA-CD does not. A lossless compression scheme called Meridian Lossless Packing (MLP) exists for DTS but this cannot be used with the DVD-Video format, only with DVD-Audio. Of course, on DVD it's possible to use uncompressed PCM, even in high resolution up to 24 bit at 96 kHz, but DVD-Video only supports stereo PCM. Multichannel PCM is limited to the DVD-Audio format. DST is short for Direct Stream Transfer - a losslessly compressed variant of DSD. Lossless compression means every single bit from the original input stream is delivered at the output after decompression, just like a zipped file on your PC would be reproduced bit by bit, only DST is unzipped on the fly. DST is used on multichannel SA-CDs . DSD128 is DSD at twice the default sampling rate: 5.6448 MHz. DSD128 is used in some studios for editing. The normal DSD format is also called DSD64 where confusion is possible. DXD is short for Digital eXtreme Definition - a sound encoding scheme for professional use that was developed for editing high-resolution recordings because DSD is not ideally suited for editing. DXD is a PCM-like signal with 24-bit resolution sampled at 352.8 kHz - eight times 44.1 kHz. The data rate is 11.2896 Mbit/s - four times that of DSD. SBM is short for Super Bit Mapping - one of various methods for down-converting an audio signal from a higher resolution to a PCM signal with the desired resolution. It involves techniques known as dithering and noise shaping. Direct SBM is the method for converting a DSD signal to 16-bit 44.1 kHz PCM in one step in order to minimize noise because every decimation step potentially adds quantization noise. On hybrid SA-CDs with the Direct SBM label, the audio on the CD-compatible layer is derived from the DSD master using this process. No, that isn’t likely to happen. Blu-ray Disc (BD) and HD-DVD are aimed quite squarely at storage of (high-definition) video and secondly on data storage for computers. No audio-only variant of BD has been specified, and as far as we know DSD hasn’t been included in the range of optional audio formats on BD. You may consider SA-CD to be the HD Audio complement to BD. Both formats work with newer versions of the multichannel audio standards by Dolby and DTS: Dolby TrueHD and DTS-HD offering up to 7.1 channels of audio. Like Dolby Digital and DTS however, these audio formats are primarily designed for use with movies. A Super Jewel Box is a newer, improved version of the ubiquitous original jewel case used with the majority of CDs. You can recognize a Super Jewel Box by it's rounded corners which are less prone to breaking when dropped, especially the hinges. Another improvement is that it permits visuals on all six sides, including the top and bottom surfaces. There are three versions: a compact version, used with SA-CDs, a medium-sized version, used with DVD-Audio discs and a tall version used with some DVD-Video discs, mostly music titles. No, some SA-CDs are packaged in traditional jewel cases, digipacks or other forms. No, a Super Jewel Box is certainly no guarantee for an SA-CD, especially since Universal Music has started using them for many most of their new releases in 2006. Hybrid SA-CDs you can play on every CD player. Only single-layer SA-CDs cannot be played on regular CD players. See What is a hybrid SA-CD? above. Of course if you have a regular car CD player you can play the CD-compatible layer of hybrid SA-CDs. If you want to enjoy them properly however you'll need a car SA-CD player. Since Q1 2007, Sony has a range of such players for the 'aftermarket', including stereo as well as multichannel models. As of the same quarter, Bose has announced a 'universal media player' for cars, supporting SA-CD as well as DVD-Audio. This, on the other hand, is a line-fit model, i.e. factory-installed. Thus far it's only available in one Ferrari model. Most DVD players simply recognize (and play) an SA-CD as a CD. A few early models can be confused because before they spot the CD layer they detect a DVD layer with content that they can't decode. No HD-DVD player with SA-CD support was ever made. SA-CD-compatible Blu-ray Disc players include (the first two generations of) Sony’s PlayStation 3 and certain models from Oppo, Denon, Marantz, McIntosh, Lexicon and Cambridge Audio. Hybrid SA-CDs can be played as CDs on all consoles that support ‘Red Book’ audio CD. The high-density layer will only play on a PlayStation 3. The output is just stereo via the analog AV out. The SPDIF output is silent during SA-CD playback. Multichannel audio is available only via HDMI however the signal is not DSD but high-resolution PCM: 24-bit at 176.4, 88.2 or 44.1 kHz (configurable as of firmware version 1.90). The SA-CD layer cannot be played in any PC drive - not even in those Sony VAIO PCs that support DSD audio. The CD-compatible layer of hybrid SA-CDs can be played but some early CD/DVD drives have difficulties due to misdetection (mistaking the high-density layer for a DVD). Pure CD-ROM and CD-R/RW drives that do not support DVD will work reliably. Never say never but so far SA-CD's copy protection measures have not been cracked. Besides, you cannot buy SA-CD recordable discs nor SA-CD writer drives. Copying the CD-compatible layer of a hybrid SA-CD will be possible on an audio CD recorder if it is not protected with SCMS. It may also be possible on PCs; see Can I play SA-CDs on my PC? above. SPDIF (coaxial or optical digital audio output) is not compatible with DSD; only with PCM (IEC- 60958) and MPEG2 Multichannel, Dolby Digital & DTS (IEC-61937). Reportedly some Sony SA-CD players perform down-conversion to PCM 88.2 kHz, a sampling rate which is officially not part of the SPDIF spec but in practice supported by many AV receivers nowadays. i.LINK, also known as FireWire and IEEE1394, is a high-performance serial bus used for connecting peripherals to multimedia computers. It can carry DSD audio in a secure way but there are few devices (SA-CD players and AV receivers) that can handle this. SA-CD players include Sony’s SCD-XA9000ES and Yamaha’s DVD-S2500. HDMI supports DSD audio from version 1.2 up. PlayStation3 uses version 1.3 of HDMI but thus far it doesn’t provide DSD output. See Can I play SA-CDs on my games console? above. Players that do include Pioneer’s DV-600AV and Oppo’s DV-980H. i.LINK with DSD is not a common feature (yet) but it’s available on various receivers, including Sony’s STR-DA9000ES, Pioneer’s VSX-59TXi and VSX-84TXSi, and Yamaha’s RX-Z9. HDMI from version 1.2 up supports DSD but although several receivers are compatible with this HDMI version, so far few of them decode DSD. Models that do include Sony’s STR-DA5300ES (called TA-DA5300ES in Japan), Marantz SR60001, SR7001, SR8001, SR7002 and SR8002, Yamaha’s RX-V661, RX-V861, RX-V1700, RX-V2700, RX-V1800, RX-V3800 and RX-Z11 (DSP-AX661, DSP-AX761, DSP-AX861, DSP-AX1700, DSP-AX2700, DSP-AX1800, DSP-AX3800 and DSP-Z11 in some regions), Denon’s AVR-3808 and AVR-4308 and Onkyo’s TX-SR805, TX-SR875 and TX-NR905 receivers. There are so far about 4,500-5,000 releases worldwide. Some early titles are no longer available. About 4,000 of these can be ordered from vendors and third-party sellers linked to www.SA-CD.net. Check the database on www.SA-CD.net - it's the most comprehensive list of SA-CDs on the web. At the time of the most recent update 443 labels have released one or more SA-CDs. The total number we do not know - it keeps growing and some of the manufacturers are quite esoteric companies that aren't always easy to spot. According to estimates by Sony,by June 2007 "the cumulative quantity of SA-CD hardware delivered to market is around 20 million including PlayStation 3. The number of models available in the market would be now close to 200 from 43 manufactures". We know of no information that contradicts this. That's a matter of preference. Advantages of 'universal' players obviously include compatibility with more media using fewer devices but as a drawback you may feel the video circuitry distorts the audio. Even if the device offers the possibility to disable the video circuits you may still feel it's surely a compromise. In that case, or when you don't object to having multiple devices for your various media, or if you listen to music and watch movies in different rooms, a dedicated CD/SA-CD audio player may be your best choice. Otherwise you'll probably find the combined player more convenient. In terms of connections: It depends on whether you want to connect an SA-CD player with multichannel output rather than just stereo. If so, you'll need a receiver with multichannel input: depending on the SA-CD player's outputs you may use i.LINK or HDMI (see Are there any amplifiers or AV receivers that accept DSD input?) but the most obvious (though not the most convenient) solution is using 6 analog connections. This is common on all modern AV receivers but truly audiophile amplifiers in many cases are still stereo. Concerning fidelity: there are definitely sound quality differences between receivers but it must be said that even an affordable, mainstream receiver can let you hear the difference between CD and SA-CD. When it comes to accuracy in the time domain (see Wasn't CD supposed to deliver perfect sound?) the receiver is usually not the bottleneck (nor are the speakers): the carrier is. There are exceptions: some receivers internally convert analog signals to PCM in order to do processing in the digital domain. Depending on the design, this may be PCM of RBCD quality: 16-bit resolution and 44.1 or 48 kHz. Of course, the benefit of DSD is lost then. Some of these receivers allow bypassing these conversion steps (at the expense of equalizing and other adjustments) but do stay alert. Of course, for a multichannel speaker configuration you'll need more speakers and cables than for a stereo setup. Regarding quality, the same counts as for the amplifier: even with mainstream speakers and cables you'll be able to appreciate the sound quality improvement of SA-CD over CD, because the wires will typically not be the bottleneck. Once you have upgraded other parts of your chain (the player, the music carriers) you may however become more critical of your speakers and cables, and there is no limit as to how far you can go. Many home theater systems are primarily designed for use with Dolby Digital and DTS where having relatively small surround speakers and larger is perfectly normal, often supported by a setting on the receiver to switch between identical speakers and larger plus smaller speakers. Multichannel SA-CD is best enjoyed with five identical speakers (plus an optional subwoofer; see the next question) or at least with rears from the same speaker family but that doesn't mean you won't be able to enjoy great sound until you've upgraded all of your speakers. This depends on your taste as well as your receiver. Note that even multichannel titles often do not use the .1 channel. If you're not using a subwoofer it's helpful if your receiver has a feature called 'bass redirection', to make sure you don't miss too much. Some SA-CDs include a duplicate of the bass signal on the .1 channel for use with sub-sat systems which will need to attenuated or disabled on full range systems. Where the subwoofer is placed is not critical: with low sounds, due to their long wavelength, it's practically impossible to tell where they come from. If you plan to use your setup also for watching movies you'll be glad to hear this layout is quite compatible with Dolby Digital and DTS 5.1. It's not a disaster if the angles don't match exactly, for instance if the rear speakers are further to the back. More critical probably is the distance of all speakers. A perfect circle ensures identical travel times for the sound from all speakers. For Dolby Digital and DTS, AV receivers often offer time delay settings to compensate for varying distances but because DSD sound (and analog sound) are much more difficult to process in such ways, for SA-CD you'll probably not be able to use this feature. With all of the sound questions above there is one advice that always holds true: Rely on your own ears. Listen and judge for yourself. No, you don't need golden ears. Even untrained people can fairly easily notice and appreciate the difference between 44.1-kHz 16-bit PCM and 2.882 MHz 1-bit DSD - also in stereo. Even people who are deaf on one ear have said they notice how SA-CD sounds more natural than CD. No, even with just two ears, humans have a remarkable capability to tell the direction sounds come from - a trait we probably developed in ancient times when this contributed significantly to our chance of survival.